Before you read about the probate process, you may first want to see if you need to go through probate. Click here to see if it applies to you. File an application with the appropriate probate court, together with a certified death certificate and the original Will and codicils. The application will list basic information about the decedent, including the beneficiaries under any Will or codicil and all heirs at law. Once the probate court receives the application, it will schedule a hearing to admit the Will and appoint an executor. If there was no Will, the court will appoint an administrator. In certain circumstances, usually when there is a Will and there are no issues in dispute, the probate court can either streamline the hearing process or dispense with the hearing if all interested parties sign waivers. The probate court will provide the executor or the administrator with fiduciary certificates to evidence his or her authority to act on behalf of the estate. If the decedent owned real estate, the probate court will provide a Certificate for Land Records that the executor or administrator will record with the town clerk showing that the executor or administrator has been appointed. Immediately after appointment, the executor or administrator should marshal the decedent's assets and determine the value of all assets on the decedent's date of death. All assets that were owned by the decedent in his sole name must be reported to the probate court. To do so, the executor must file an inventory form listing the solely-owned assets and their date-of-death values with the probate court within two months of appointment. Certain assets owned by the decedent need not be reported on the inventory. These include anything payable to a named beneficiary (so long as the named beneficiary is not the estate), such as life insurance policies and annuities. Other assets that need not be reported on the inventory are joint bank accounts, which transfer automatically on death to the joint owner without the need for probate court oversight. Although some assets may pass outside of probate, the executor will need to know the date-of-death value of these assets to complete the estate tax return, discussed in further detail below. Once the executor is appointed, the probate court will have a Notice to Creditors published in a local newspaper. Creditors generally have five months from the appointment of the executor to present claims against the estate to the executor. The decedent may also have outstanding bills of which the executor is already aware, such as the funeral bill, an ambulance bill, or payment for nursing home services. After the five-month notice to creditor period expires, the executor has an additional 60 days to file a Return and List of Claims with the probate court, detailing what expenses and claims have been made against the estate. Within 6 months after the decedent's date of death, the executor must file a Connecticut estate tax return , regardless of whether any estate tax is due. For estate tax purposes, under both state and federal rules, the estate consists not only of the solely-owned assets but also the decedent's interest in any joint assets or assets that pass outside of probate. Therefore, the executor must confirm the date-of-death value of all assets in order to complete the estate tax return(s). The Connecticut estate tax return must be filed no matter the size of the estate. At present, only estates valued at $2,000,000 or higher have Connecticut estate tax exposure. Those estates must file the Connecticut return with the Department of Revenue Services. 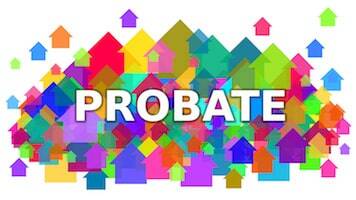 Estates valued at less than $2,000,000 need only file the return with the probate court. Within 9 months after the decedent's date of death, the executor must file a federal estate tax return if the estate is valued at $2,000,000 or more. Currently, only estates valued at $5,49,000 or more (indexed annually for inflation) have federal estate tax exposure. Federally taxable estates must file with the Internal Revenue Service. Estates valued below the federal estate tax exemption amount must file the return with the Department of Revenue Services. If estate tax is due, it must be paid at the time of filing the return. Extensions to file the estate tax return, both federal and state, are permissible. After the respective state and federal taxing authorities have reviewed the estate tax returns, each will send the executor either confirmation that the estate tax calculation was accurate or a letter advising of any deficiency. If no estate tax is due, the probate court will issue a certificate or other evidence that will confirm that no estate tax was due. If the decedent owned an interest in real property, an additional certificate will be issued which must be recorded on the land records. Upon receipt of the assessment and evidence that all taxes were paid or none are due, the executor can start to prepare a Final Accounting and Proposed Distribution of the Estate. and listing a proposed distribution of the remaining assets in the probate estate. After the executor files the final accounting, the probate court will hold a hearing and if no objections are raised, the court will accept and approve the final accounting and proposed distribution of assets to the beneficiaries. The executor then distributes the remaining assets accordingly. The executor could make advanced distributions before the final accounting is approved by the probate court, so long as he retains sufficient assets to pay all expenses, claims, and taxes. The executor is personally liable if there is a shortfall because of making an advanced distribution.